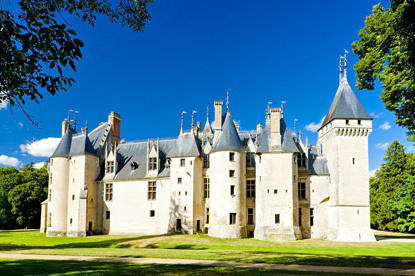 The oldest part of the castle was started by Count Étienne II de Sancerre in the late 13th and early 14th century. Dying heirless in 1308, the castle passes to the Bueil family, then by marriage to the Amboise familly in 1438. Most of the present structure was erected from 1473 by Charles I of Amboise, chamberlain and counselor of King Louis XI. His son, Charles II d'Amboise de Chaumont, one of the king's favourite, became Grand Master of France, Marshal then Admiral. 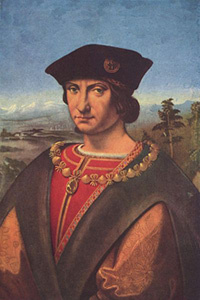 He also served as governor of Paris, Milan and Genoa, and Lieutenant general of Lombardy. The money that he subtracted from his government in Milan prompted Cardinal Dovizi da Bibbiena to say that "Milan made Meillant". After Charles's death in 1511, the property is inherited by his son, George, who dies childless at the Battle of Pavia in 1525. Meillant then passes through a succession of proprietors. Among them are the Dukes of Béthune-Chârost. The 6th and last duke, Armand II Joseph (1738–1800) was known for his philanthropy. He would launch the project for the Canal de Berry joining the Loire to the Cher River. The duke was so adulated by his people that, during the French Revolution, when he was emprisoned and ready to be sent to the guillotine in Paris, the population of Meillant rose to demand his liberation. This is in part why the castle wasn't damaged during the revolution. In 1857, the castle winds up into the hands of Casimir de Rochechouart, Duke of Mortemart. His descendants still occupy the castle today. Descended from the Viscounts of Limoges, the House of Rochechouart of Mortemart is one of the oldest aristocratic families in France. The castle is composed of 90 rooms, the most sumptuous of which are open to the public. The main drawing room spreads on 200 m² (2150 ft²) and has a loggia for musicians above the central fireplace. Also of interest are the valuable tapestries from Bruges. The castle is open from 1st march to 15th Novembre from 10:00 to 12:00 noon (except in March) and from 2:00 pm to 6:00 pm (until 6:30 pm from May to August). It is open without interruption from 10:00 am to 6:30 pm in July and August. Admission is 7.5 € for adults and 5.5 € for children.